Trinco district Commander Sornam seen extreme left after unveiling the name board of Thyaka TheepamThileepan Memorial Service Medical Unit of LTTE. The ceremonial opening event began with the mother of a LTTE martyr lighting the common flame of sacrifice. Muttur LTTE political head Mr.Thangan hoisted the Thamileelam flag. Mr.Iynkaran, deputy political head of LTTE in Trincomalee district lit the flame of sacrifice to the photograph of late Colonel Thileepan. Mr.Isaiarasan, Muttur LTTE military wing head garlanded the photograph of Thyagi Thileepan. 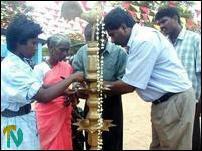 Ms Kaaronja, LTTE Trincomalee district women wing political head presided over the event. 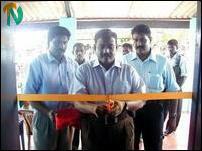 Thamileelam Health Services Department head Mr.Arun speaking at the event said first Thileepan medical unit was opened in February in the year 2002 at Katsilaimadu in Vanni region and the 11th Thileepan dispensary has been opened in Pattalipuram in Muttur east. LTTE Trincomalee district political head Mr.Elilan helping the mother of a LTTE martyr to light the common flame of sacrifice. "We proudly announce that in the world only in Thamileelam, Thileepan medical units have been functioning 24 hours a day. 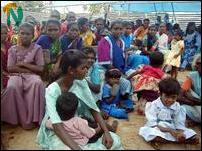 We are working on a project to provide better medical services to our people through Thileepan medical units. Medical officers working in our dispensaries are not only engaged in treating patients but also dedicated for the uplift of the residents living in remote villages in the spheres of social and economic development", said Mr.Arun. Mr.Arun further said "We have been working on a project to provide the services of medical consultants to the villagers once in a month." LTTE Trincomalee district political head Mr.S.Elilan said, "Our national leader's objective is not only to regain our lost traditional homeland but also to build a Tamil nation with healthy and talented people. Our national leader works with total dedication towards this goal." 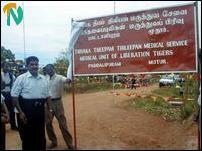 Dr.Venian attended to the first patient who sought medical treatment in the new Thileepan medical unit. Mr.S.Santhiralingam, village level officer, and Mr.S. 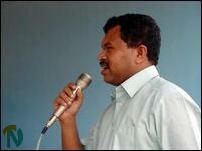 Suntharamoorthy, headmaster of the Pattalipuram government Tamil school also spoke. Mr.Lavan of Aham Institution proposed vote of thanks. Officials of the NorthEast Provincial Ministry of health also attended the event. 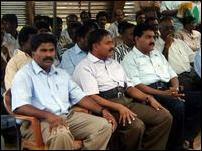 (L-R) LTTE Trincomalee district political head Mr.S.Elilan, Colonel Banu, LTTE Trincomalee district military Commander Sornam and Tamil Rehabilitation Organization ( TRO ) Trincomalee Director Mr.K.Mathavarajah are seen at the opening event of the Thileepan hospital. 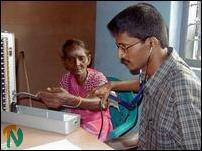 Dr.Venian examining a patient in the newly opened Thileepan dispensary. 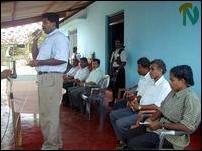 Mr.Elilan speaking while (L-R) Colonel Banu, Commander Sornam, Mr.Arun, Thamileelam Health Services head, Mr.Santhiralingam, Mr.S.Sunthermaoorthy and Ms Kaaronja, LTTE Trinco district women political wing head are seen. Thamileelam Health Services head Mr.Arun speaking. A section of the women attending the event. Colonel Banu opening the medical unit ( left) Mr.Elilan and (right) Commander Sornam are seen.